Update: 36 people have now done the micro survey on the use of solution-focused techniques in a team-setting. Most of them are coaches and consultants. The majority is from Europe (28). Most used techniques so far are: Scalewalking, miracle question in teams, past success question, what-is-better question. I'd to get some more responses - also from people from the other continents.... 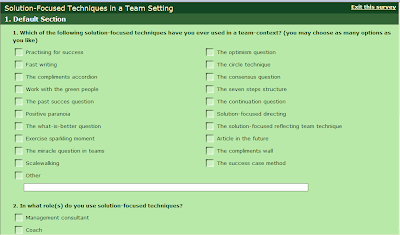 So, please click here: Solution Focused Team Techniques Micro Survey. It only takes a minute. Of course, the results will be presented here.